Isabel - violin, electric violin; Darko Rundek - bass, guitar, synthesizer, percussion, lead vocals; Đani Pervan - drums, bass, percussion, backing vocals; Vedran Peternel - sound effects, processing; Dušan Vranić - piano, bandoneon, harmonium, zither, melodica, organ, backing vocals; guests: Arnold Achard - cello; René Aubry - guitar, quatro, Philippe Botta - soprano sax; Marc Buronfosse, Laurent Le Gall - double bass; Nenad Grahovac - trombone; Jakša Kriletić - clarinet, sax; Jean Baptiste Laya - guitar; Loma Gosa - string quartet, Igor Pavlica - trumpet; Producers - Isabel, Peternel, Pervan, Rundek. The comédie des sens of Paris meets the European spleen of Zagreb. Cosmopolitan influences of immigration clash with Balkan traditions. Join the Cargo Orkestar for a mysterious musical journey, rough and real, made of questioning, pain, joy and humour. The first song ‘Ista Slika’, is launched with a bassline that brings to mind Lou Reed’s ‘Walk on the Wild Side’. But where Lou mumbled in the dark, Darko declaims in the light, while electric guitar and a small string section play a dramatic arrangement between the verses. What is he singing about? I don’t know, and it doesn’t seem to matter. There’s a bigger challenge for singer-songwriters who record for an audience unfamiliar with their language (Rundek is Croatian) – they have to keep us interested with unusually good melodies, arresting arrangements, and indications of humour or desperation. Darko achieves al this and more, and as I revisit the album, I’m increasingly embarrassed that it has taken me so long to discover the virtues of other songs. ‘Kuba’ begins with a finger-picked violin playing counterpoint to a bassline, a combination that recurs throughout the album. ‘Makedo’ has a swirling, rousing feel that makes you want to get up and look out of the window for a while; but just as you get there, it clams down while the cellist fences with the percussionist, so you sit down again. While several instruments of a jazz group are deployed at one point or another (piano, trombone, clarinet), it certainly isn’t a jazz album. He’s not trying to impress us; he’s here to entertain. Which he does – so much so that this is one of those albums that rarely reminds me of anything else. Eastern European music has never really been my thing; generally speaking, I see the word "Balkan" and my eyes start to glaze over... 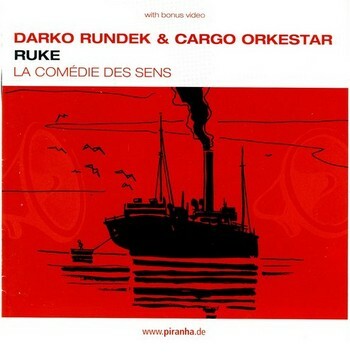 But then there are always surprises, particularly discs like this odd, atmospheric offering by Darko Rundek, a Croatian actor and musician who was once in a band called Haustor, and now fronts the uber-eclectic Cargo Orkestar... The opening number is enough to put any open-eared world music fan on notice: this ain't your grandma's Balkan music. Mixing moody, murky jazz-pop with styles indigenous to his Yugoslavian homeland -- notably gypsy and Arabic melodic themes -- Rundek crafts a multilayered, multifaceted, artsy sound, equally challenging and compelling, music that may remind listeners of irony-drenched, postmodern troubadours such as Tom Waits and Paulo Conte, who have taken their creative efforts into a different stratosphere than the legions of rude rockers and rappers that drown the soundscape. Anyway, even though the Slavic culture remains alien and unappealing to me, I could still recognize the spark of brilliance and timelessness in this album... It's definitely worth checking out! Rundek is a seasoned Croatian maverick whose roots lie as much in theatre as music, and he brings a thespian angst to the oddball songs here. 'Balkan Gothic' is probably the best term to thread together the mixture of electric violin, reggae horns, wistful declamation and surly folk. The resulting brew of styles and influences takes in Balkan, Middle Eastern, Mediterranean, Latin, reggae, rock, chamber-orchestral and electronic sounds - blended with a wonderfully sure and sparing hand. One of Rundek's favoured techniques is his hypnotic use of repetition and layering around a few key melodic and vocal figures, gradually introducing instruments, harmonies and variations as tracks unfold, perhaps most memorably in the title song. Elsewhere, though, he takes an entirely different tack: Ti I Ja (You And Me) crosses big-band slink and swagger with the seductive smooch of a French chanson, while Tigidigi Rege serves up a ridiculously high-spirited Croatian-ska party chorus. Throughout the album, though, you're unmistakably in the presence of a fascinating musical mind.